The first thing I did was figure out how I was going to lay out the shape of the shelves. I thought about stencils and measurements, but then I came across another idea…templates. I remembered reading about printing templates from Sketchup. Sure enough, my memory had served me well…I blogged about it here. This worked like a charm. 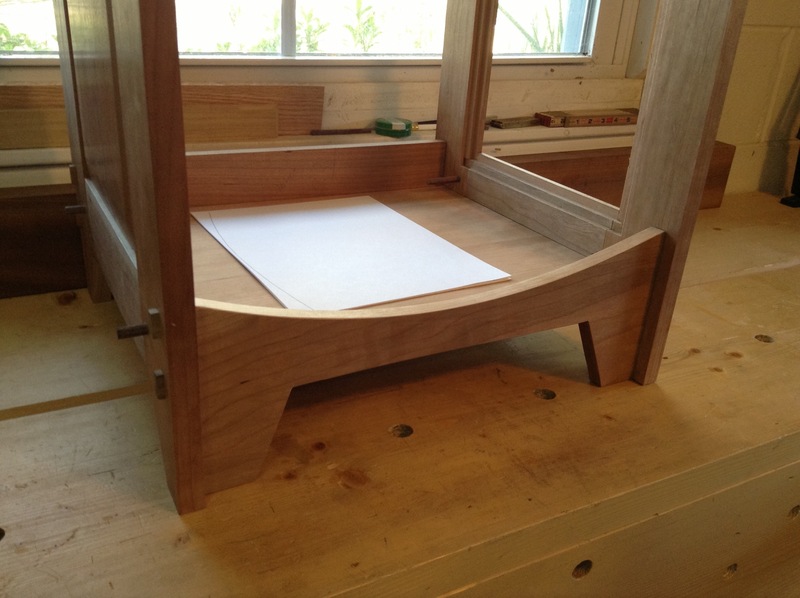 In no time I had myself a nice set of templates that are perfectly proportioned to the rest of the chiffonier. Basically, if it looks good on the model, it will look good on the real thing too. So I went for it. I did have to piece the template together with tape before tracing it out…as the paper I have is only 8 1/2 x 11. After marking it out with pencil, I moved on to the cutting. Now, I wasn’t too careful with the marking and cutting…but that was for a reason. It doesn’t have to be perfect because the shelves aren’t right next to each other. They just have to be close enough for your eye to see they’re the same. 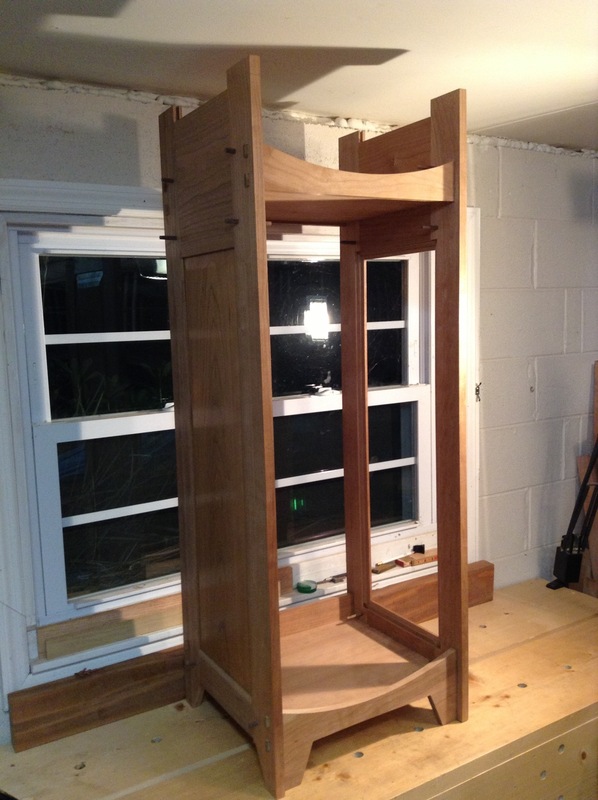 This is a revelation I discovered that has changed my woodworking. It don’t need be perfect. I was a little apprehensive about using my new bow saw. However, I knew this would be a great test. I had no idea how it would cut, as I had never even tried a test cut…just went for it. I left the blade in that came with the saw, which is supposed to be a middle of the road blade…not to course and not to fine. Well, I found it to cut too slow and fine and the handle would spin in my hand. This would cause the blade to change direction too easily, making it hard to stay on track. I actually had a couple of brief thoughts about returning the saw. Then after cutting the first piece, I switched to the more aggressive blade that came with the saw. Big difference. I stayed on track easily and finished in half the time. 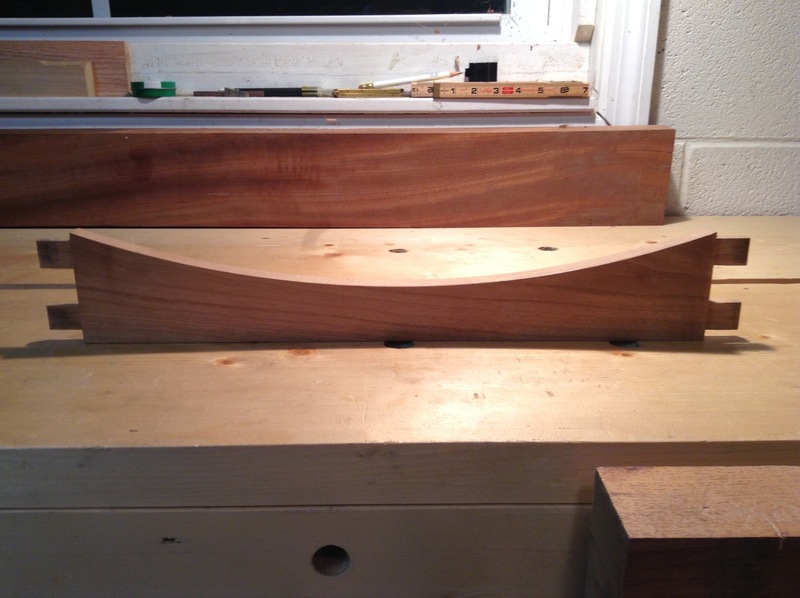 The saw is a definite keeper…I just have to remember to select the right blade for the cut. Naturally the cut needed some refining. 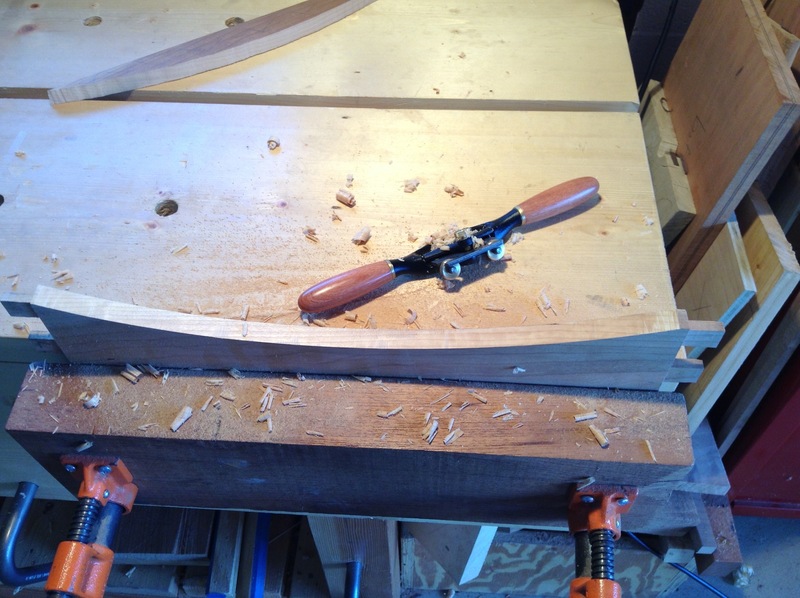 The perfect tool for the job is the spokeshave. It just so happens I have a new Veritas spoke shave. I have been playing with it a bunch…what a fun tool…so I was pretty comfortable with it. It didn’t take too long to clean up and shape the shelf pieces. There were a couple of tricky spots where the grain changed. A few light passes in the right direction, plus some skillful use of the chisel took care of it. I must say, adding these curves totally change the piece. They have a huge affect on the overall look of the Chiffonier. It’s lighter, softer, and the lines seem to flow into each other. I love me some curves. I can’t wait to start shaping the side panels.